The project of Merkur Offshore is making progress: Keep yourself updated. For a while, the huge parking lot behind GE’s wind turbine factory in Saint-Nazaire, France, looked like a base for AT-AT walkers, filled with rows of giant gray-and-red wind turbine nacelles. These massive structures rise 10 meters from the ground and shelter the generator and other parts for GE’s Haliade offshore wind turbines from the elements. But the steel behemoths, all 66 of them, are now gone. Perched 100 meters above the North Sea, the machines will soon power Merkur, one of Germany’s largest offshore wind farms, located some 35 kilometers from the sandy beaches of Borkum island. Each of the turbines has a rotor that spans 150 meters in diameter and has the capacity to generate 6 megawatts. GE installed the last of them on Friday, Sept. 14. When the 400-megawatt Merkur comes online, it could generate up to 1,750 gigawatt-hours annually — enough to supply 500,000 German homes with renewable electricity. Germany aims to generate 65 percent of all electricity from renewable sources by 2030, and the offshore wind farm is part of this transition. GE Renewable Energy designed and built the GE Haliade 150-6MW, and the turbines use huge blades manufactured by another GE company, LM Wind Power in Castellon, Spain. Five of the same turbines are already working at America’s first offshore wind farm near Block Island, Rhode Island. While the Haliade 150-6MW is gigantic in its own right, GE and LM Wind Power engineers are already working on the next design. The Haliade-X 12MW will be the world’s largest and most powerful wind turbine. Just one 12-megawatt turbine will be capable of powering the equivalent of 16,000 European homes. Built to work in waters as deep as 160 feet (50 meters), the Halide-X’s record-breaking rotor will span 220 meters in diameter — a distance longer than two football fields. Eidesvik Offshore has secured a contract for its vessel Viking Neptun to support work on the Merkur offshore wind farm in the German North Sea. 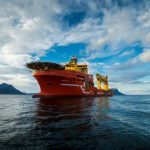 The contract will begin in mid-September and will see the vessel working on the 396MW project for five months, with 2,5 months optional periods, Eidesvik said. “We are very confident that the Viking Neptun will be a huge benefit for the progress of the commissioning works of Merkur with an unrivaled capacity and workability that can make the very best out of the upcoming winter months towards final operation of the wind farm in Q1 2019,” said Merkur Managing Director, Arjen Schampers. According to the Norwegian company, the commercial terms of the contract are confidential between the parties. 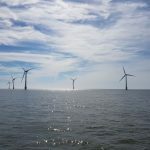 The Merkur offshore wind farm will comprise 66 GE Haliade 6MW turbines installed some 45km north of the island of Borkum in the German Exclusive Economic Zone (EEZ). 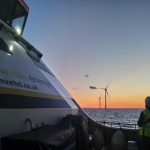 The project, developed by Merkur Offshore GmbH, a joint venture between Partners Group, InfraRed Capital Partners, DEME Concessions and Coriolis, produced first power in June following a successful test on one of the turbines. 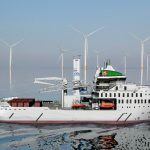 Ulstein Verft has signed a ship building contract with the Germany-based Bernhard Schulte for a service operation vessel (SOV) of the ULSTEIN SX195 design type developed by Ulstein Design & Solutions AS. 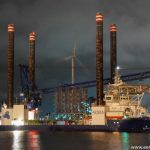 The vessel will support the maintenance work of GE Renewable Energy at the German wind farm Merkur Offshore.The project has been developed in cooperation with WINDEA Offshore, which is the Bernhard Schulte’s affiliate for offshore wind projects. “Ulstein Verft is a very reliable yard and we are eager to start working together with ULSTEIN again. We have worked closely and successfully together on two former projects, and these vessels are operating very good in the field,” says Matthias Müller, Managing Director at Bernhard Schulte Offshore GmbH. “We have previously designed and built several vessels within the renewable energy segment. Sustainable growth is essential for us and we look forward to working with Bernhard Schulte again, an important player in the offshore wind segment,” says Ulstein Group CEO Gunvor Ulstein. “This will be our third service operation vessel to Bernhard Schulte and it shall be delivered early 2020. The first two vessels were delivered in 2016 and 2017. We will do our utmost to fulfil their expectations also this time,” comments Kristian Sætre, Managing Director at Ulstein Verft. The vessel is of the SX195 design type and is thoroughly developed by Ulstein’s design team in Ulstein Design & Solutions. The design is modified to fulfil the GE Renewable Energy tender requirements and the ship owner’s special choices of mission equipment. It has a large, centrally positioned walk to work motion compensated gangway & elevator tower for personnel and cargo transfers. Furthermore, a 3D compensated crane capable of 2-ton cargo lifts is available. The optimised on-board logistics includes large storage capacities, of which half is under roof in a controlled environment, and stepless approach to the offshore installations. The vessel is equipped with a fuel-efficient drive system including battery-solution from ULSTEIN. With all main equipment and operations in the aft ship, the vessel will naturally operate astern while in-field. Keeping the X-STERN® towards the weather, there will be no slamming, noise or vibrations caused by the waves. The crew will get complete rest between shifts. The vessel will be 93.4m long and 18m wide and is optimised for offshore wind. The vessel can accommodate up to 120 persons. The facilities on board are modern and of a high quality. The ship is flexible and attractive for work within areas such as O&M (Operation and Maintenance) or construction support especially in challenging weather and sea conditions. The Merkur offshore wind farm has produced its first power following a successful test on one of the wind farm’s GE Haliade 6MW wind turbines, according to Merkur Offshore GmbH. The first test on the MO40 turbine generated power to the mini-grid. Power was gradually increased to 2MW, which was the maximum power that could have been achieved with the wind speed at the time, Merkur Offshore said. Further power tests will continue the coming days if the wind speed allows it. The jack-up vessel Seafox 5 is currently installing the 66 GE Haliade turbines at the site in the German North Sea, with more than a third of the units now in place. 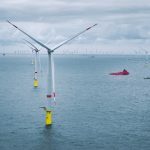 The remaining turbines are scheduled to be installed by September 2018 and the 396MW offshore wind farm is expected to be fully commissioned in 2019. EWE Offshore Service & Solutions GmbH (EWE OSS) has won a contract to provide technical maintenance of the Merkur offshore substation in the German North Sea. The Merkur substation will collect the electricity generated at the 396MW wind farm and feed it into the German grid. “With EWE OSS, we have a reliable and experienced partner for the maintenance and repair of the substation at our side. 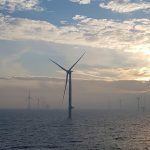 This marks another significant milestone on the way to the commissioning of the entire wind farm by the end of 2018, “ said Arjen Schampers, Managing Director of Merkur Offshore GmbH, the developer of the wind farm. The two companies are said to be discussing further areas of cooperation as well. EWE OSS plans to utilise the proximity of its existing projects, Alpha Ventus and Trianel Windpark Borkum, to create synergies and provide a cross-project logistics and maintenance support. Merkur is located in the German Exclusive Economic Zone, some 45 kilometres north of the island of Borkum. The project covers a total area of 47km² and will comprise 66 GE Haliade 6MW wind turbines, a third of which have now been installed. The wind farm’s offshore substation was installed on site in January 2018. Jack-up Seafox 5 has installed the first GE turbine at the 396MW Merkur offshore wind farm in the German North Sea. The project, which is located some 45km north of the island of Borkum, will consist of 66 Haliade 150-6MW machines. In January, SHL’s heavy lift crane Oleg Strashnov installed the topside for the offshore substation, with the jacket foundation having been installed in October. Transmission system operator TenneT is expected to connect Merkur to the Dolwin gamma grid hub in August 2018. The Seafox 5 jack-up has arrived in Eemshaven to load the first set of wind turbine components for the 396MW Merkur offshore wind farm project in the German North Sea. 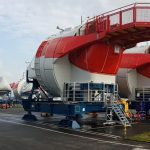 The first nacelle of one of the 66 GE Haliade 6MW turbines was loaded onto the 151-metre vessel over the past weekend, Merkur Offshore GmbH, the owner and developer of the wind farm, said. The nacelles are being produced at GE’s Saint-Nazaire factory in France, and then shipped to Eemshaven, where they are prepared for installation at the offshore site. The blades are made in Castellon in Spain by LM Wind Power, and the towers are manufactured in Germany and China. Located some 45km north of the island of Borkum in Germany, the Merkur offshore wind farm is expected to be completed by the end of 2018 and fully commissioned in 2019. Prior to arriving in Eemshaven, the Seafox 5 underwent a refit in Damen Verolme Rotterdam (DVR) shipyard in preparation for the Merkur project. Merkur Offshore GmbH is a joint venture between Partners Group, InfraRed Capital Partners, DEME Concessions and Coriolis. GE Renewable Energy has awarded DHSS with a ships agency and port logistics services contract for the Merkur offshore wind farm in the German North Sea. DHSS will carry out the activities from its new supply base in the Port of Eemshaven, the Netherlands, beginning mid-February with service operation vessel Vestland Cygnus and involved crew transfer vessels. According to the company, DHSS’ new offshore supply base with preferred berthing space is in the heart of GE’s shore-based operations in the Port of Eemshaven, and is ideally located for all phases of the wind farm’s lifespan. In October 2017, DHSS announced it will build an offshore wind farm service hub at an A1 location in Beatrixhaven, at the heavy cargo quayside of the port. The Dutch subsidiary of EMS Maritime Offshore (EMO) is building a service base for the Merkur wind farm in Eemshaven on behalf of Merkur Offshore, the developer of the wind farm. GE Renewable Energy, the provider of 66 Haliade 6MW wind turbines for Merkur, will use the entire infrastructure for the upcoming years. Located approximately 35km north of the island of Borkum, the 396MW Merkur offshore wind farm is expected to be completed by the end of 2018 and fully operational in 2019. Global Wind Service has been selected by GE Renewable Energy as a primary partner for the commissioning and completion scope at the 396MW Merkur offshore wind farm in the German North Sea. The work scope consists of onshore commissioning preparation activities as well as electrical and mechanical offshore duties such as tensioning, completion, punch-lists, MV activities including switchgear testing, MV cable preparation, and HV work. GWS chief commercial officer Michael Hoj Olsen said: “We are very pleased that GE Renewable Energy has chosen GWS as their partner on installation, mechanical and electrical completion and commissioning for this project. Turbine installation is on the starting blocks at DEME’s 396MW Merkur wind farm in the German North Sea. Jack-up vessel Seafox 5 is currently being mobilised in the Dutch port of Rotterdam and is scheduled to arrive in Eemshaven in early February to begin loading out hardware. 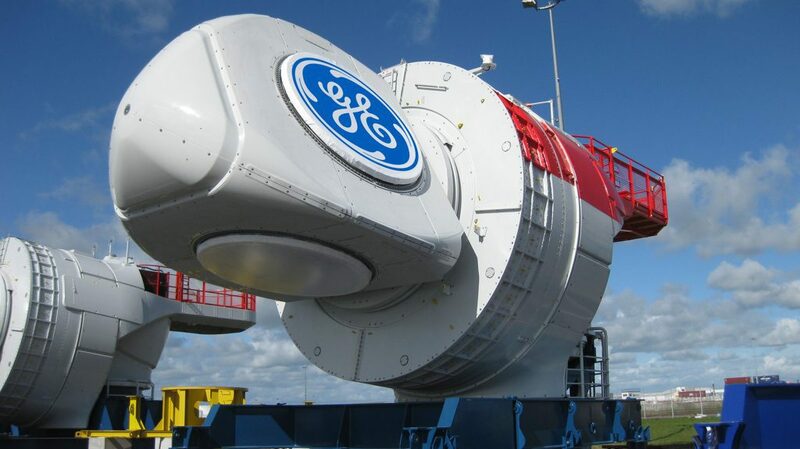 GE is supplying 66 Haliade 6MW machines for the wind farm 45km north of the island of Borkum. Van Oord vessel Nexus has meanwhile installed 18 Prysmian-made array cables at the site. The ship is due to report elsewhere for work early in March and it will be replaced at Merkur by Global Marine cable-lay vessel Symphony. A2Sea jack-up Sea Challenger has installed 25 transition pieces to date. Unfavourable weather is delaying the delivery of a new batch of the components from Spanish joint venture Idesa-Windar but this will not knock the installation schedule, said Merkur Offshore executive Arjen Schampers. The wind farm, being developed by Partners Group, InfraRed Capital Partners, DEME Concessions and Coriolis, is scheduled to begin commercial operations in 2019. The 2,660t topside for the Merkur offshore substation was lifted yesterday, 11 January, from a transport barge to the Oleg Strashnov heavy lift vessel, which is expected to install it on its foundation today. Seaway Heavy Lifting’s Oleg Strashnov installed the substation’s jacket foundation at the construction site in the German North Sea in October 2017, while the topside was loaded out at ENGIE Fabricom’s yard in Hoboken, Belgium, in mid-December. The joint venture between Engie Fabricom-Tractebel and Smulders/Iemants was awarded the contract for the offshore substation and associated jacket for the 396MW Merkur offshore wind project. 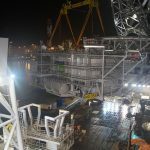 Oleg Strashnov has been working on jacket installation at the Beatrice offshore wind farm off Scotland, and was announced to leave this month and hand over the work to its sister vessel Stanislav Yudin. 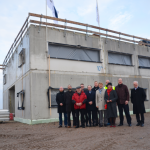 EMS Maritime Offshore (EMO) has celebrated the topping-out ceremony of its second building for the Merkur offshore wind farm service base in Eemshaven, the Netherlands, and expects to have it fully built on time with no delays despite winter weather. Knut Gerdes, EMO Managing Director, said the decision to rely on familiar, regional partners paid off, and due to the work conducted by the Kooi construction company, the works are on schedule with no delays expected in spite of weather conditions. The building is the second service base facility for EMO in Eemshaven, with the site at Beatrixhaven still offering construction areas and free spaces. Merkur Offshore GmbH, the developer of the German 396MW Merkur offshore wind farm, signed a long-term contract with EMO in October 2017 for the construction of the service base. The developer will rent the 500m² office complex with an adjacent 600m² warehouse area from May, while GE Renewable Energy, the provider of 66 Haliade 6MW wind turbines for the wind farm, will also use the entire infrastructure for the upcoming years. The Merkur offshore wind farm, located approximately 35km north of the island of Borkum in Germany, is expected to be fully operational in 2019. Global Wind Service (GWS) has been contracted by GE Renewable Energy to support turbine installation at DEME’s 396MW Merkur offshore wind farm in the German North Sea. GWS will help jack-up Seafox 5 install 66 Haliade 150-6MW machines starting in mid-February 2018. The work is expected to take about six months, the company said. The turbines will feature 73.5-metre blades manufactured by LM Wind Power in Spain. A2Sea jack-up Sea Challenger is currently installing 66 transition pieces at the wind farm site. Merkur is being developed by a consortium featuring Partners Group, InfraRed Capital Partners, DEME Concessions and Coriolis. Paris, December 12th 2017 – GE Renewable Energy announces the depart of the last set of nacelles to be shipped this year to Merkur’s Offshore Windfarm logistical hub in Eemshaven Netherlands. By the end of the month this hub will have received 24 nacelles, 24 blades, and several other tower fragments and transition pieces. With all these component in-place, local teams will perform some pre-assembly works while getting prepared for the installation phase that is set to begin mid-February 2018. The offshore turbines have three main components – nacelles, towers, and blades — that are manufactured in different locations and then shipped to Eemshaven, where they are prepared for the eventual installation at sea. 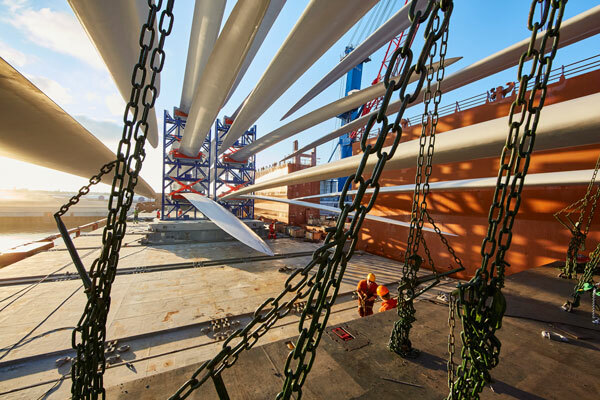 Nacelles are produced in Saint-Nazaire (France), the blades are made in Castellon (Spain) by LM Wind Power, and the towers are manufactured in Germany and China. Remaining nacelles, blades and tower pieces will continue to be shipped to Eemshaven logistical hub until mid-summer 2018. Installation of the 66 GE Haliade 150-6MW is expected to be completed by end of September 2018. Merkur windfarm is located approximately 35km north of the island of Borkum, Germany, in the North Sea, and consist of 66 turbines that will generate approximately 1,750 GWh annually, enough clean energy to power around 500,000 homes. When completed, Merkur will be one of Germany’s largest offshore wind farms. The Haliade™ 150-6MW turbine was specifically designed for a marine environment. 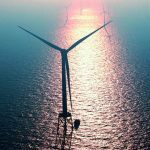 Thanks to its 150-metre rotor, its output is 15% higher than the offshore turbines of the same generation, and can save up to 21,000 metric tons of CO2 annually. At a total height of 170 metres, the Haliade is almost twice as tall as Big Ben, and its 150-meter diameter blade is comparable to twice the wingspan of an Airbus. Manor Renewable Energy (MRE) has won a contract to supply temporary power, personnel and a multi-purpose vessel to GE Renewable Energy for the Merkur offshore wind farm in the German North Sea. Under the contract, MRE will provide temporary power pods, designed and manufactured in-house, with a 2000L integrated fuel tank to reduce the refueling and vessel intervention of smaller tanks. “The German market is key for MRE and the Merkur OWF is now our sixth project in the last 3 years and we are hugely excited to be working with a new client in GE Renewable Energy,” MRE Director, Toby Mead, said. The 396MW Merkur offshore wind farm, owned by Merkur Offshore GmbH, is currently being constructed 45km from the island of Borkum. The wind farm, comprising 66 GE Haliade 150-6MW turbines, is expected to be completed by the end of 2018 and fully operational in 2019. A2SEA’s jack-up vessel Sea Challenger arrived at the Orange Blue Terminal in the Eemshaven port last night, 31 October, and will soon start installing transition pieces (TPs) at the Merkur offshore wind farm, Eemshavenonline.nl reports. A2SEA’s spokesperson told Offshore WIND that the vessel is currently finalising the mobilisation in Eemshaven and is expected to sail out of the port with the first TPs at the end of the week. The first 6 of the total of 66 transition pieces were transported from Spain to Eemshaven in mid-October, with RollDock Shipping carrying out the transport of all the TPs using its vessel RollDock Sea. The Buss Orange Blue Terminal signed a contract with GeoSea in June, under which it will to accommodate the temporary storage, final assembly and transportation of the transition pieces to the wind farm via a jack-up vessel. GeoSea, who took over A2SEA, kicked off the installation of monopiles in April this year. German 396MW Merkur offshore wind farm is being built 45km to the north of the island of Borkum and will feature 66 GE Haliade 6MW wind turbines scheduled for commissioning in 2018. 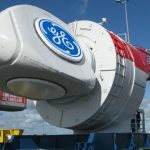 GE Renewable Energy has published a photo showing its Haliade 150-6MW nacelles for the 396MW Merkur offshore wind farm being assembled at the company’s Saint-Nazaire site in France. The nacelles are stored at Saint-Nazaire, while new ones continue to be manufactured, and will then be shipped to the company’s logistical operations hub in Eemshaven, the Netherlands, from where the installation process will begin in spring 2018. The first out of the total of 66 Haliade 6MW nacelles left the manufacturer’s assembly line in April. 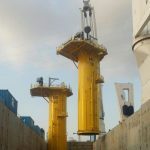 The installation of monopiles at the offshore construction site 35km north of the German island of Borkum also started in April this year, when GeoSea installed the first one. Merkur Offshore, the developer of the wind farm, recently signed a contract with the Dutch subsidiary of EMS Maritime Offshore (EMO) for the construction of a service base in Eemshaven, from where the company will be carrying out part of its maintenance and service works for the offshore wind farm from spring 2018. GE Renewable Energy, who will supply the wind turbines for Merkur, will use the entire infrastructure for the upcoming years. The wind farm is scheduled for commissioning in 2019. 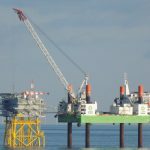 The installation of monopiles at the offshore construction site 45km north of the German island of Borkum started in April of this year. The transition pieces are sent off from Spain since they were produced by the Idesa-Windar joint venture. Dutch-based company RollDock Shipping is carrying out the transport of all the 66 transition pieces using its vessel RollDock Sea. 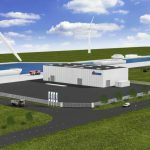 The Buss Orange Blue Terminal, located in the Dutch port of Eemshaven, has already commenced preparations for the Merkur offshore wind farm. In June, the terminal signed a contract with GeoSea to accommodate the temporary storage, final assembly and transportation of the transition pieces to the wind farm via a jack-up vessel. In September, A2SEA – recently taken over by GeoSea – informed that its jack-up Sea Challenger will mobilise in October to transport the transition pieces from Eemshaven to the offhore site, where it will help install them. The 396MW Merkur will consist of 66 GE Haliade 150-6MW wind turbines and is scheduled to be fully operational in 2019. 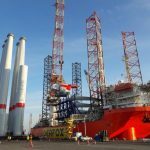 Fabricator Iemants has completed the load-out of the jacket foundation for the offshore substation for the 396MW Merkur wind farm, which will be located in the German North Sea. 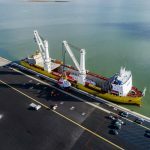 The 1700-tonne jacket was loaded at Vlissingen in the Netherlands and will be shipped to Eemshaven before being transported to the project site “in the coming weeks”, Iemants said. The company added that final assembly of the substation topside is currently ongoing at the Hoboken yard of its joint venture partner Engie Fabricom. The topside will be ready for load-out and sail-away in December after which it will be installed offshore, Iemants added. Merkur will consist of 66 GE Haliade 150 6MW turbines that are slated for commissioning in 2019. 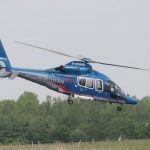 Northern HeliCopter (NHC), which was contracted for the Merkur offshore wind farm by GeoSea in January, recently carried out an ad hoc flight as the Innovation vessel called for urgently needed spare parts. Within few hours the necessary parts were delivered to NHC’s base at Emden and then transported to the offshore site. GeoSea and Northern HeliCopter have signed a framework agreement for helicopter transportation to the installation vessels, with the services also including ad hoc flights. “This was the perfect “kick-off” to prove our professional and problem solving attitude within NHC”, said Guido Schmitt, NHC Flight Operations Manager. The Merkur offshore wind farm – owned by Merkur Offshore GmbH – is located approximately 45km north of the island of Borkum and covers an area of 47km². It will consist of 66 GE Haliade 150-6MW wind turbines and generate approximately 1,750GWh of power annually, once completed. The project will be fully commissioned by end of 2018. Northern Netherlands Offshore Wind (NNOW) will hold a Supply Chain Meeting at Groningen Airport Eelde on 23 May, when Dutch local businesses will be able to check out the opportunities German Merkur offshore wind farm is set to create in the Netherlands. 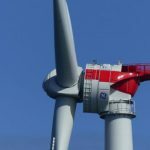 GE Renewable Energy will hold a presentation at the meeting, as the company is the supplier of offshore wind turbines with a 15-year maintenance contract. The construction and O&M will be organised from Eemshaven, creating opportunities for cooperation with and orders for Dutch companies. The project will require support from local businesses in the area of logistics, technical repairs, safety and personnel training. 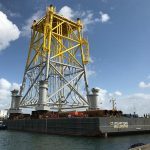 The offshore construction of the 396MW project, situated north-east of Schiermonnikoog and 45km north of the German island of Borkum, started at the end of April. The Merkur offshore wind farm will consist of 66 GE Haliade 150-6MW wind turbines and will produce, when completed in 2019, about 1,750 GWh of electricity annually. GeoSea has installed the first of 66 monopiles on the 396MW Merkur offshore wind farm in the German North Sea. GeoSea, part of DEME Group, is the general contractor for engineering, construction and installation of foundations, the offshore substation and the internal array grid. Offshore transport of wind turbine generators is also included in the scope of GeoSea’s works. The Merkur offshore wind farm – owned by Merkur Offshore GmbH – covers a total area of 47 square kilometres and is located approximately 45 kilometres north of the island of Borkum. It will consist of 66 GE Haliade 150-6MW wind turbine generators and will produce, when completed in 2019, about 1,750 GWh of electricity annually.